The Weather Surveillance Radar, 1988 Doppler (WSR-88D), also known as NEXRAD, is the most advanced operational weather radar in the world. The fleet of 160 WSR-88D radars operate 24/7 to support the weather warning and forecast missions of the National Weather Service, FAA and DoD. 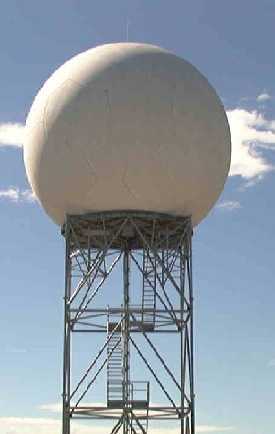 Additionally, real-time radar data is made available to the nation’s academic and commercial weather enterprise. Pictured to the left is the tower, which houses the antenna (inside the radome). Receiver Noise: -114dBm (Short Pulse), -118dBm (Long Pulse) Referenced to Antenna Port. The WSR-88D RDA transmits short bursts (pulses) of electromagnetic energy focused into a 1 degree beam by the antenna. During normal operation, the antenna and thus the beam rotate continuously according to a prescribed scanning program, or “volume coverage pattern (VCP).” The VCP directs the beam through 360 degrees in azimuth about a vertical axis, and range from 0.5 to 19.5 degrees (0.2 to 19.5 degrees at a single coastal location) above horizontal. NOTE: The WSR-88D supports the execution of a variety of VCPs. Each VCP is designed to optimize the likelihood of sampling particular meteorological phenomena. Execution of a VCP is determined by the observed or expected meteorological conditions, desired elevation density and data quality expectations for the base data moments. The RDA sends the base data moments (reflectivity, velocity, and spectrum width) and Dual Pol variables (differential reflectivity, correlation coefficient and differential phase) to the Radar Product Generator (RPG). The RPG processes these data to produce base products and executes resident algorithms to generate real-time, user-requested meteorological and hydrological products. The RPG also manages all WSR-88D communications, as well as, product and data distribution. To optimize the WSR-88D RDA operations and data collection, RPG algorithms analyze radar data strength, coverage and location to dynamically modify the active scanning routines and data collection schemes. Additionally, the RPG provides the human computer interface for WSR-88D command, control and status monitoring.